We'll be using this thread for a game/series of games of Fiasco. If you want to join the next round (assuming we do another), send me a PM or poke me over skype or something. Our first game will use this FiM playset. I'll take a 1 and define my relationship with Paper's character as a Friendship. Taking a 2 and defining my relationship with Quietkal's character as family. I'll define my Friendship with Paper using a 3, Best friend he/she just met 2 minutes ago. I'll take a 1 for a Magic Object in my relationship with Paper. I'll take a 1 for the Need to Get between me and Ramsus, making it Needs to Get Cutie Mark. I will use the last 6 and define the Magic Object as the Long-lost scepter of secrets. Taking a 4 to define the Quietkal-Paper Need To Find as "a lost item." Overcast is filly with a dream. A dream of being the top weather-pony in all of Equestria and getting her cutie mark in weather-crafting related activities. The only problem is that she's not a pegasus. Despite what others say, be it "that's really not a good idea" or "hahahaha" or "you might want to consider something that will come more naturally to you", she's determined to do whatever it takes to fulfill her dream. Including constantly bothering Cloud Cover, Manehattan's chief weather-pony, for tips and advice or just following her around watching (and attempting to imitate) her weather-crafting. After another exhausting day of trying her hardest to flap wings she doesn't have and otherwise manipulate the wind and clouds, she has gone to Hot Toppings to get a slice of pizza to refuel her tank, where she is about to have a fateful encounter with Olive Leaf. Though she may be new to her current position as Chief Weather Pony, she is very comfortable in her position of leadership, though she has been known to come off the wrong way on some ponies in the strangest ways. For example, there's this little unicorn filly following her around everywhere, insisting she let her try controlling the weather in Manehattan, at least for one day, and it's gotten to the point where she's debating two things: give in, or shove a cloud down the unicorn's throat. At least the unicorn can't follow her up into the clouds, though up there, there's a different problem. Cloud's little brother, [Quietkal], seems to think that she actually likes this little unicorn filly, and that she likes the unicorn more than she does her own brother. Oh, what an idiot. At least he has his Cutie Mark, and isn't pestering her to help him find out what it is like he was. What is it with foals and trying to get her to help them out in making their flanks not as blank? She might as well just go work at Flight School, if everypony thinks she's so good at helping with that. Cloud Cover is 24, and slightly taller than the average mare her age, though thankfully she's still shorter than most stallions. Cutie Mark is an umbrella-shaped cloud. 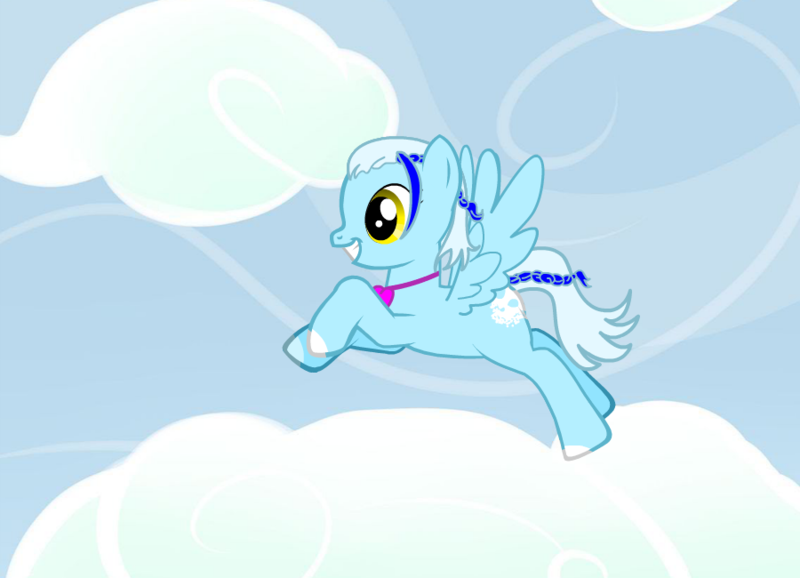 Meet Ivy Bramble, the Pegasus! 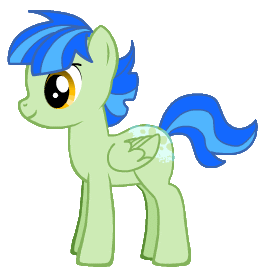 Ivy's approximately 14, and earned his cutie mark depicting a single (ivy) leaf perhaps a year or two ago. He's a little clingy to the things he likes, and has a picked up the bad habit of claiming things as 'his.' 'His' chair at Hot Toppings, 'his' bocce ball set, other examples of that nature...and 'his' older sister Cloud Cover is certainly no exception. He goes to the Hot Toppings restaurant almost everyday, where he voices his mind more than he should to those willing to listen, and has developed a sort of friendship with the owner, Olive Leaf. A confrontation Something important is going to happen between him and Cloud Cover at the museum, which will redefine their relationship. A staff of secrets Something will need to be found, and that will further define his relationship with Olive Leaf. Scene 1 will begin at Hot Toppings. It will be Overcast's first visit where she will make her special connect with Olive Leaf. She will at a random table (that may or may not be "Ivy Bramble's"). At some point Ivy Bramble will show up. So... anyone got anything to add before we start RPing the scene? Why is she there? Just trying to have a nice lunch? Wants to talk with Olive Leaf about something? It's also sort of important if she's at Ivy's table if he's going to be there as well, so I'd appreciate if you established that, if not entirely relegate that confrontation to another scene. Overcast, tired and hungry from another day of chasing her dreams, walks through the door of Hot Toppings, having decided to try to place out since she was in the area and have never been here before. She takes a seat at a random open table (one that just so happens to be one who a certain colt would claim as "his") and examines the menu.